Today I'll be quoted in the National Post talking about obesity rates and likely some relationship will be drawn to the incredible indirect and direct health care expenditures attached to it. Well today I've got a more positive spin on how obesity helped one man hit an incredible payday. Tuesday night Christie's auction house sold a painting by Lucien Freud entitled, "Benefits Supervisor Sleeping". According to CNN, The painting was painted over a period of 9 months back in 1995 and it's of Ms. Sue Tilley, a British governmental benefits manager. With the sale Freud gained the honour of his painting selling for the highest dollar value of any painting ever painted by a living artist. That's $3.73 million a month or $124,000 per day for the 9 months he spent painting it. Unfortunately Ms. Tilley didn't get paid quite as well - she took home a comparatively anorexic $51/day. UPDATE: I received a phone call today from someone who felt this post was offensive to folks with weight to lose. Frankly I don't see it. I definitely don't understand art, that I'll readily admit and I can't fathom how any painting of anything is worth 33.6 million dollars. 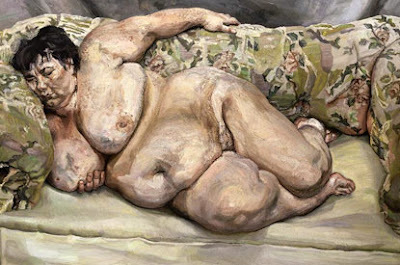 I think it's a great painting and wonderful that the model wasn't self-conscious about her weight as frankly body image need not be tied into weight, but the post was really meant to highlight the tremendous value that society has placed on weight as evidenced by the incredible dollars spent on a portrait of an obese woman lounging on a sofa. Anyhow, if anyone else was upset by this post feel free to let me know in the comments.